In my previous review of The House Restaurant I asked, “When is a house not a home?” The answer was when “The House” was a new restaurant venture from the owner Hans from Denmark (originally) and the chef Pom (originally Thai but has worked in South Africa, Guam and Bangkok, amongst others). However, that has changed a little, with The House becoming more like a home, and a Spanish one at that. This is following the recent opening of The House Wine and Tapas Bar. The Spaniards are a gregarious lot, liking to sit around, sharing a bottle or two of wine and eating some snacks, which they call ‘tapas’. During my time in Spain, it was the Spanish rough red, Sangria, that we drank, as we were fairly impecunious, but it was always a wonderful start to an evening. Evenings that sometimes extended well into the night, with congenial friends and convivial food and drink. It was with this in mind that prompted the concept of the Wine and Tapas Bar for Hans and Pom. The House building also lent itself to the concept, with many rooms available, and two of the downstairs areas at the front were selected for the venture. The tables and chairs are simple wood items, fitting the concept nicely. However, the decor is somewhat out of character, being eclectic, rather than Spanish, and the Chinese lanterns did seem a little out of place, but “arai gadai” as they say in Thailand (as I have forgotten what they used to say in Spain)! Tapas being evening nibbles, the Wine and Tapas Bar will be open from 6 p.m. until midnight, allowing you to drop in on the way to the concert, and drop back afterwards. Well, that’s what Hans and Pom would like to see! The Wine and Tapas Bar has its own dedicated menu, with the smaller tapas on one side, ranging in price between B. 50-120. This includes mussels in a spicy sauce, grilled eggplant and red pepper with mozzarella and tomato sauce or even a potato tortilla with whisky sauce. On the other side of the menu are some larger items, for those times when you decide you’re not in the mood for the concert anyway, and are going to stay on and need something that little bit more substantial. These limited items include gravelax with mustard and dill sauce (B. 220) or chicken stuffed with prunes and mixed nuts served with home-fried potato and grilled capsicum in sago corn sauce at B. 190. If you are really ravenous you can also order a US Angus Sirloin steak and all the trimmings for B. 550. There are also some desserts, all loaded with chocolate and thousands of calories. You’ve got my number, Khun Pom! We began with a Hawke’s Bay Vidal Estate 2001 Merlot, and pulled the cork on a 1998 Santana Tinto to allow this Spanish wine to breathe a little. Then on came the tapas. Referring to my tasting notes of the evening, I had written beside the potato tortilla and whisky sauce “great”, then beside the mussels “fab” with two exclamation points. Then beside the prawn on cheese tortilla I had written “fantaslinck” which on later reflection meant that not only had I enjoyed it very much, but the wine was catching up as well! Once again owner Hans has come up with a good concept and chef Pom has come up with some wonderfully palate pleasing tastes. Despite having had a very long day, I found that I was still enjoying nibbling even though it was late when we arrived. The second bottle of red spelled the end, however, and Miss Terry was taken (dragged?) home. The House Wine and Tapas Bar is certainly another option for the dining out set, and the ‘wining out’ set too. Do try it, especially the prawn on cheese tortilla and avocado salsa. Highly recommended. I can guarantee we will be back. Hans, open the Vidal Estate Merlot 2001 now! 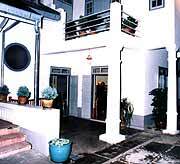 The House, 199 Moonmuang Road, T. Sriphum, Amphur Muang Chiang Mai, telephone 053 419 011, fax 053 419 010, email the [email protected] Secure parking within the enclosure.